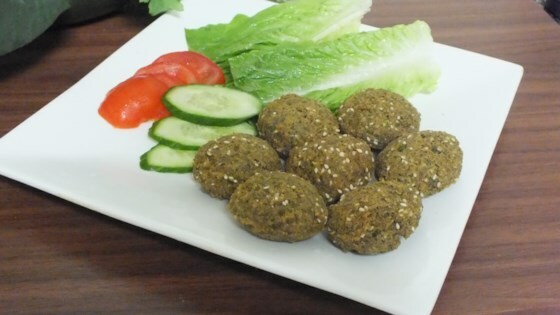 "These falafels are the closest thing to NYC street vendor falafels! Made the traditional way with dried soaked chickpeas! Great on a pita with lettuce, cucumber and yogurt. Asafoetida is usually found in Middle Eastern or Indian food stores. If you prefer, you can use 2 to 3 garlic cloves and 1 small chopped onion instead. This is a great base recipe, customize it to your own tastes." Place dried chickpeas in a bowl. Fill with water to cover; stir in baking soda. Soak at least 8 hours or overnight in refrigerator. Drain. Place soaked and drained chickpeas in a blender or food processor; blend to a paste. Pour water into chickpea paste and blend until smooth. Scrape down sides of blender with spatula if needed. Place sesame seeds, cumin, salt, baking powder, coriander, black pepper, red chili powder, sugar, turmeric, and asafoetida powder in blender with chickpea paste; blend until well mixed. Transfer chickpea mixture to a bowl. Chill chickpea mixture in refrigerator to allow flavors to blend, at least 1 hour and up to two days. Pour vegetable oil to a depth of 1 inch in a deep skillet over medium heat and heat to 370 degrees F (188 degrees C). Scoop up chickpea mixture by heaping tablespoons and form into balls the size of ping pong balls. Fry balls in hot oil until golden brown, 3 to 5 minutes on each side. I omitted the baking soda, baking powder and sugar. These are great tasting burgers that I dry fried instead of deep fat fried. I'll be making them again! Great recipe! I just loved it.